Map of proposed South Village historic district. Image Credit: LPC. Proposed historic district would encompass approximately 250 buildings south of Washington Square Park. On June 25, 2013, the Landmarks Preservation Commission held a hearing on the proposed South Village Historic District. The proposed district is roughly bounded by Washington Square to the north and Houston Street to the south, between Sixth Avenue and LaGuardia Place. The proposed district is comprised of approximately 250 buildings, primarily residential, though also includes commercial and institutional structures. The first major wave of development in the area took place during the 1820s and 1830s, as the City expanded northward. Several Federal and Gothic Revival-style rowhouses remain from this era as an upscale residential community. In the 1850s, immigrants began to populate the area, as wealthier citizens migrated further uptown. Rowhouses were converted into multi-family dwellings, and the area saw the construction of the first tenement buildings. Tenements remained the dominant building type throughout the 19th century, and were built in a variety of styles, including Italianate, Neo-Grec, Queen Anne, and Renaissance Revival. By the early 20th century, the neighborhood was largely Italian and the focal point of Italian-American culture. In the 20th century, the neighborhood became a center of bohemian life in the City, with multiple music venues, cafes, theaters, and a thriving gay community. State Senator Brad Hoylman attended the hearing to voice his support for designation of the district, which he called an “epicenter of early lesbian, gay, bisexual and transgender life in the City,” as well as a “hotbed of political and social revolution.” A representative of Council Speaker Christine Quinn urged Landmarks to designate the district as presented. A representative of Assembly Member Deborah Glick said the district was “full of rich architectural and cultural history,” and urged Landmarks to move swiftly on designation. Executive Director of the Greenwich Village Society for Historic Preservation Andrew Berman said the proposed district was “one of the most important places manifesting evidence of our nation’s last great wave of immigration in the 19th and early 20th centuries.” Berman also noted its artistic significance as the home of the Provincetown Playhouse and performances by such figures as Bob Dylan and Lenny Bruce. Simeon Bankoff, of the Historic Districts Council, said the “architectural mélange works hand-in-hand with the immigrant history of this district,” and that the neighborhood served as a “palimpsest” on which successive waves of “outsider populations” have repurposed to their own ends. Resident Anita Isola said the district “represents Italian and Italian-American history” and, that if not protected by landmarking, developers “are ready to swarm down like locusts.” Other residents expressed concern about inappropriate development in the neighborhood, and pressed Landmarks not to excise New York University’s Vanderbilt Hall, at 40 Washington Square South, from the district, so that the university could not replace it with a tower. There was no testimony in opposition to designation. A date has not been scheduled for a vote on designation. 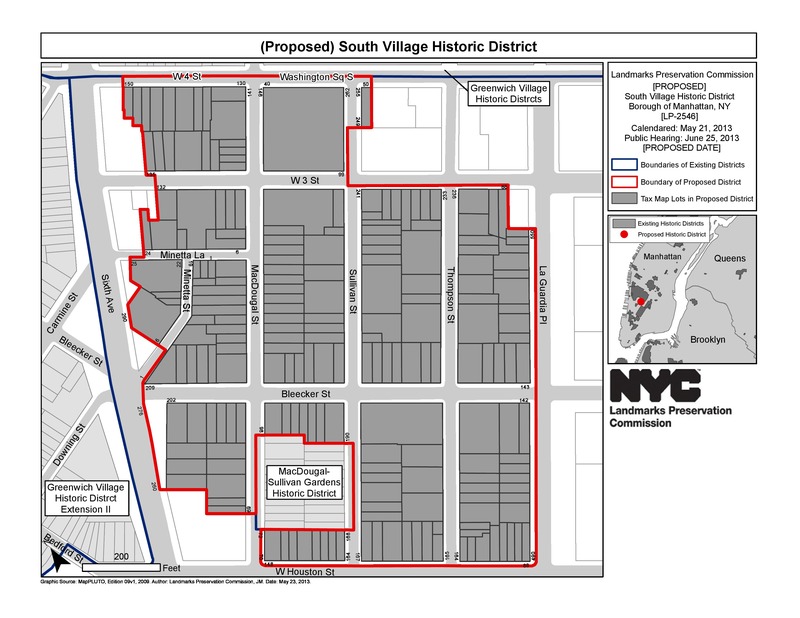 LPC: Proposed South Village Historic District, Manhattan (LP-2546) (June 25, 2013).